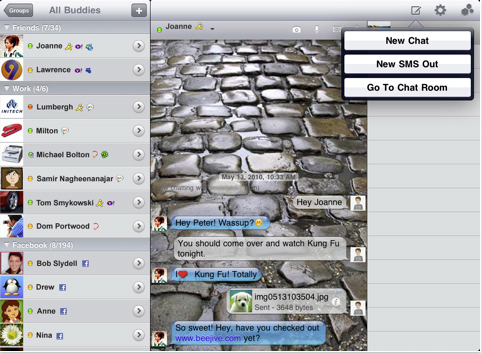 Instant messaging clients have been a part of our computing landscape since, well, since before the internet actually. But in recent years with all of the other options that we have like text messages, iMessage, Facebook Messenger or Google’s Huddle, many of the once-great go-to IM clients have fallen by the wayside. Gone are the glory days of ICQ and AIM. Today’s IM landscape is ruled by cross-platform clients that handle multiple protocols so that you can talk to all of your friends at once. This list has been narrowed down to the best of the best apps only. The criteria here is that they have to be good to look at, easy to use and, most importantly, frequently updated. A recent bug caused by a change Google made to their protocol caused popular clients to begin spouting XML gibberish and only developers that are updating their clients regularly had fixes out in a timely fashion, illustrating the importance of a living, breathing client over legacy-ware. Technically, Google Talk isn’t just a client, and there is no native app for the Mac, aside from support built into the other multiple protocol apps out there. But it is ubiquitous, as it comes pre-installed in every Google account and you can use it right from your browser on any computer. And it is extremely rare to see any clients that don’t support Google Talk. The downside to Google Talk is that, until recently, you absolutely must have had a Google account to use it and it only communicated with other Google users. Recently, Google added support for AIM, which is something, but we’d like to see it be able to talk to all of the other protocols out there. Design-wise it’s nothing special to look at, but it is simple and functional in a ‘designed by coders’ kind of way. It won’t win any awards for looks, but it also won’t make you gouge your orbs out. Protocols: AIM, MSN, Jabber, Yahoo, MobileMe, ICQ, Google Talk, Facebook Chat, LiveJournal, Bonjour, Xfire, Twitter, IRC, Skype, GroupWise and more. 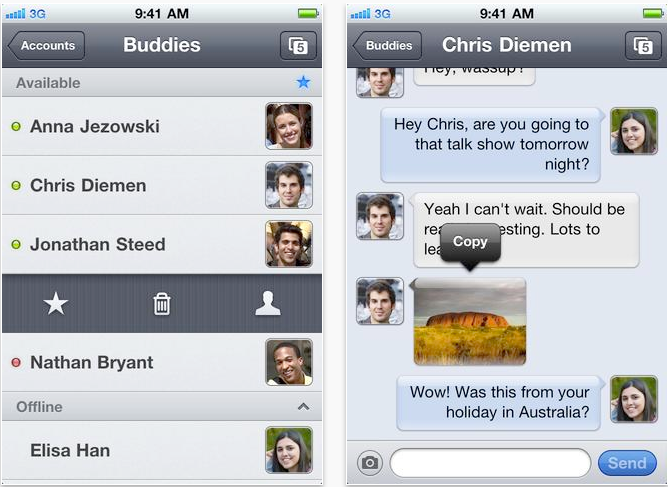 Adium is a well designed and extremely well-supported messaging client for Mac. It’s not the most cohesive looking app as it consists of modular windows that comprise the buddy list and individual conversations, but it does make it easy to separate one particular chat from the others. The app uses mostly standard Aqua design rules and looks nearly identical to any standard window in OS X. Because it is updated regularly and responsibly, Adium doesn’t stay affected by bugs like the aforementioned Google XML annoyance for very long. A patch was out for it within a day or two that got it back up and running. Multiple accounts are fairly easy to add and the contact list is presented seamlessly. If you like the look of standard windows in OS X and you’re looking for a solid multi-protocol client, you’ll probably be happy with Adium. Verbs exemplifies how good a messaging client can look on any platform, but stands out as above par even on iOS, where well designed apps are more common. The palette is a nice muted grey and blue that allows indicators, avatars and images to stand out in the interface. But easily the best thing about Verbs is its speed. 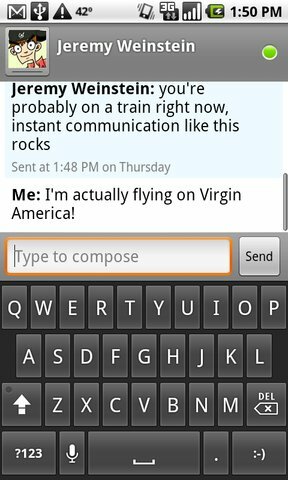 we can’t stress enough how blazingly fast the interface and messaging of Verbs is. All of the animations and typing interfaces respond beautifully and instantly. When people say ‘it feels snappier’, they’re describing the kind of responsive goodness that the Verbs interface deals out. Really top notch performance here. Integrated Cloud app support for sending files rounds out what is easily our favorite IM client on the iPhone. Once Verbs gets an iPad optimized interface we’ll be able to ditch the other clients that we’re using and go ‘all Verbs’. Trillian is a classic IM client that was one of the first multi-protocol options around and has, in one set of hands or another, kept changing along with the landscape. There are regular updates released across all of the platforms that Trillian services, which means that you’re going to get new features and bug fixes quickly, even if you use a variety of devices and computers. 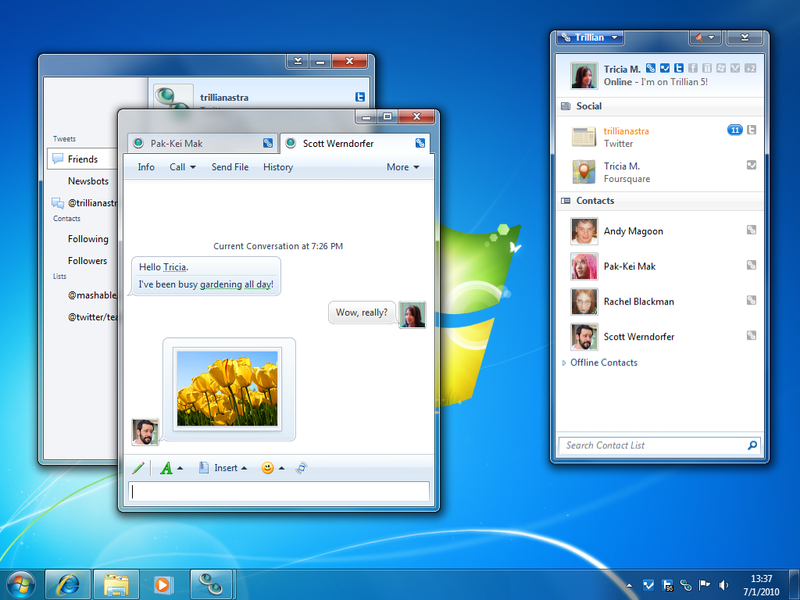 One of the killer features of Trillian is that it synchronizes across platforms. That means that any messages or changes that you make will sync from your desktop client to your Android, iOS or BlackBerry version on the go. This can make it easier to keep track of conversations and attachments that you get sent. You can also opt to get new messages as emails, much in the way that Google Talk handles this. 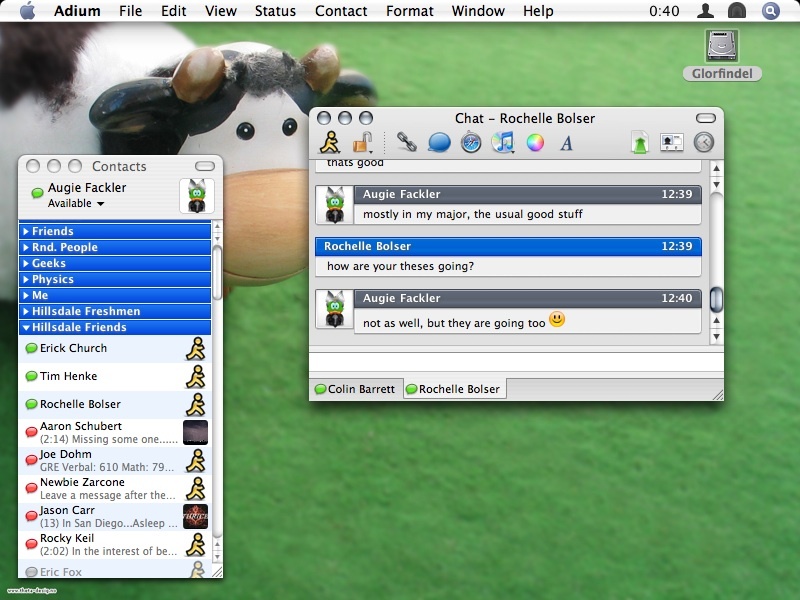 Most versions of Trillian look decent, although the Mac and Windows versions are easily the best. There are too many other great options on iOS like Verbs or Imo on Android that look prettier to make Trillian our top recommendation on those platforms unless the synchronization features appeal to you. That being said, it’s free across all platforms and could be a lot worse. Oh and it’s easily one of the best looking IM apps for BlackBerry. Beejive is one of the most agressively updated apps in this list and looks really good on most platforms, especially the iPad and iPhone. It has all of the basic options that you want in an IM app including push notifications, cross-device syncing and persistent connections. The kicker to getting aggressive updates across all platforms is the fact that Beejive is expensive. It’s $9.99, making it one of the pricier options on this list, but that gets even worse if you want to use it across multiple platforms where you’re purchasing the app over and over again for that price. That’s especially annoying on iOS where the iPhone and iPad versions are handled separately. If you don’t mind paying for it, Beejive is one of the most regularly updated and reliable IM apps out there and offers most standard features if not a deep array of options. At one point, Beejive would have been my first choice for someone wanting to IM across more than one platform, but with the depth chart so strong nowadays, it’s worth taking a look at the contenders to make sure you need to shell out $20-$30. The lack of a desktop component is also annoying, as most of the time you’re going to want to go mobile-to-desktop. Imo is a solid option that works across all major mobile platforms so you should be able to communicate with any of your friends mobile-to-mobile. It’s also one of the better examples of a native iPad app that looks good and utilizes space efficiently without getting cluttered. The standard iPad splitview is utilized well here, but the contact list is placed on the right, which makes it a little awkward when typing one-handed as you have to reach in across it in landscape mode. A small complaint though and one that only affects the iPad version. Imo has verbose push notifications that work through Imo’s servers. This means that you get notifications even when you aren’t actively chatting, although only when you’re logged in. Single signon makes it easy to log in once and have access to all of your accounts. There is also built in support for sound as well as images, which makes it stand out a bit as this isn’t a standard feature on most IM clients. Imo also has file sharing support available, through Imo’s own service. We hope you enjoyed this list of IM apps that are well-designed, easy on the eyes and continuously updated. There’s nothing worse than committing to learning an app only to find that the developers have abandoned it for consulting (I’m talking to you Meebo) or just dropped the product altogether. Let us know if there are any that we missed here that are your favorites and tell us why in the comments below.